One would expect the department of group psychotherapy at a psychoanalytic institute to be a team of several therapists who meet regularly to discuss their experiences. Unfortunately this is not necessarily the case. At this writing, group therapy has been on the program of our Dutch Institute for thirteen years, but it has been conducted by only one therapist, who worked in relative isolation. Therefore, there has been no opportunity for intracommunication, criticism, control, or indeed any comparison with the methods of other psychoanalysts. Only recently has this situation changed, since the inauguration of an enlarged group therapy department. Under these circumstances, one might question any justification for the title of this chapter. The special climate of a psychoanalytic institute, however, does make research possible. A considerable number of patients of many clinical categories can be thoroughly examined, carefully diagnosed, and made available for study. Working alone, I tried to create a manageable research situation by setting up groups that manifested comparable dynamics. For a period of five years each, I treated two groups com posed of male students of good intelligence who were well educated, unmarried, had as yet no real place in society, and who all experienced serious difficulties at work. In order to be able to evaluate the influence of group therapy, individual contact was avoided following their preliminary examination, and the attempt was made to obtain all results in the group sessions themselves. There were no alternate meetings, visitors, or observers. My reports, therefore, are rather subjective. I dictated them immediately after each session, attempting to make them brief and always adhering to the same kinds of observations. The conditions of the sessions were as similar as possible: in the same room, at the same time, twice a week, and lasting one hour. Each group was kept closed until one had been reduced to five persons and the other to four—more a little family than a real group. Breaking the policy of a closed group and adding new members furnished important new experiences. Selection of a group is time consuming, considering the necessity of combining people with some similarity in their ways of living, levels of verbal development, and possibilities of communication. Often, after the therapist believes he has assembled a circle of men who are not too disparate, the peculiar dynamics of grouping reveal their laws, and he is soon faced with his mistakes. My thesis is that the selection and com position of the group is the crux of this therapy and that the indications on data drawn from the initial individual interviews can often be misleading in this respect. It might almost seem unnecessary to mention special interest in the development of the transference neurosis in the context of group therapy research in a psychoanalytic institute, since, after all, transference is the keystone of psychoanalytic therapy. Yet, in the context of group therapy, the transference presents special problems. The therapist can discern transferences only by remaining uninvolved in the ongoing emotional processes. For the group members, involvement and not detachment must be central to their therapeutic experience. As they become involved with one another, the transference manifestations between them ought to disappear. The therapist must assume behavior appropriate for the development of a good, visible transference. He will therefore concentrate on the development of transference by influencing group processes in order to favor the relationship between each group member and himself. The therapist should try to sever each member’s ties with the other members insofar as these ties allow easy and superficial communication on the safe ground of a “tacit agreement” accepted by all. This “tacit agreement” or “code of behavior” is a typical resistance in group psychotherapy whereby each member hides individual traits and feelings that seem shameful or dangerous behind a generally acceptable facade. The therapist’s disruptive technique has nothing to do with the passivity of the so-called “mirror.” It derives from the point of view of the individual psychoanalyst, who creates his own style and his own typical experiences. It is an active interference, a structuring of the situation with an outspoken alertness to all resistances. The similarity to individual therapy is striking in that the investigator remains on well-known territory with the great advantage of being able to compare each experience with others common to him. Methodologically, there are many possible objections to this investigation. It is of a typically clinical nature, founded on subjective impressions, referring only to scarce data regarding the patient’s illness that were not systematically collected. Also open to criticism is the technique of hindering the spontaneous interaction of the group, the very process that is always regarded as the great therapeutic force of this setting. It is hoped, however, that this investigator will be forgiven his inclination to direct communications in specific directions, since his aims were to create therapeutic situations for investigation wherein there would be the possibility of working with a well-developed skill and of making comparisons with past experiences in individual analysis. In group therapy, naturally, one has to deal with forceful processes and events never encountered in individual therapy. An unpredictable interaction can bring about relations that, when fully developed, may produce circumstances that paralyze the influence of the therapist. For example, the dominance of one resistant member can be an insurmountable hindrance. Here one sees an important difference from individual therapy, where this kind of resistance is seldom untreatable. In a group, the therapist takes on the aspect of a dictator if he directly opposes and criticizes the obstructing member. One may interpret the behavior of such a member, but he is unlikely to discontinue it as long as the other members are submissive to his actions. For the therapist to seem critical rather than interpretive would make the obstructing member too anxious. Therefore, the therapist becomes largely dependent on the relations of the forces between the members who, as peers of the obstructing member, are in a better position to criticize his negative behavior. Naturally, the therapist can subtly attack the “tacit agreement” resulting from the resistance of the dominating member. For instance, when the dominating member suggests that cooperation with the therapist would constitute dull and feminine behavior, and the other members show their compliance, the most obvious reaction of the therapist—to directly discredit the idea—would be a mistake. His only course is to bring into the open the meaning of the “tacit agreement,” to make the group members conscious of it and of their fear of abandoning it. Such an examination of the “tacit agreement” will be crucial to the dominating member, who is generally the most anxious and therefore imposes his opinion with the greatest power. His anxiety is often sensed by the other members, who in turn are compelled by their own anxieties not to undermine his defense. The therapist may have to wait until a member spontaneously attacks the “tacit agreement,” but in the meantime he can focus on their mutual relations and anxieties toward one another. Sometimes the situation will not change, and the only solution is to expel the dominating member. I once had to do this. Forces within the group may become manifest in other rather unpredictable forms, such as the isolation of one of the members, the formation of subgroups, or extremely long silences. I am convinced that these resistances in a group can only be treated by a broad, general approach. Interpretations must concern every member in order to be effective. When a member cannot be reached because he is under submission to another member, or for any reason whatsoever, therapy may be seriously handicapped. We have seen how the necessity for depending on the forces of relations between members can hinder treatment in ways not encountered in individual treatment. However, there are also advantageous aspects in the tensions and “tacit agreement” that develop within a group setting. First, the great influence of the common opinion of the group members is not always in the service of resistance. It can be entirely comparable with the “therapeutic alliance,” the “therapeutic transference,” the tragfhige Uebertragung. Throughout the group therapy, one can see this adaptational force working. People gradually experience the possibility of communicating very intimate matters, of revealing weaknesses and aggression hidden in their daily lives. Guided primarily by the therapist and the most courageous member, such a therapeutic climate develops continuously. Another advantage is the increased opportunity to convince a patient of his unconscious behavior. In his view, the therapist may be but one other human being who can make a mistake in judgment. In a group, on the other hand, the patient is faced with a small community whose collective observations about his behavior may be more forceful and inescapable. The majority of members may seem to him to know the truth, and one man is not capable of fighting alone against a settled opinion. To realize the potential power and value of such encounters among peers in the group, one needs only to recall the difficulties met in analyzing the aggressive, provocative behavior of moral masochists in order to show them how they bring about defensive and self-punitive situations. 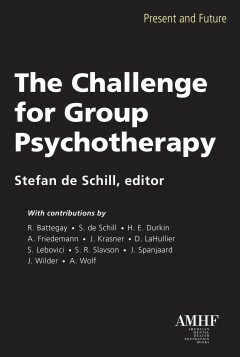 After this short introduction, we may now examine various phases that develop in the course of group therapy. There is, of course, no clear-cut manifestation of these phases in the course of time; they are of an ever-varying character, overlapping, alternating and useful only in order to make certain distinctions. In the discussion of these phases, we must not forget that the development of transference neurosis is the constant center of our investigation and technique. Every group contact begins with an orientational phase, in which members investigate each other. The attitude toward the therapist during this period is mainly a passive-dependent one. He is seen as the undeniable leader, and the member may seek refuge with him from the others or may unite with them against an unknown imminence. He is the oracle, the sorcerer who can ameliorate all sufferings, and the members usually feel they must be as docile as possible. It is a challenge for the leader not to continue this flattering situation, or be narcissistically seduced by it. The therapist who fails to distrust this positive group transference, in spite of all warnings in the literature, nourishes the development of a typical group structure of common resistance. In such a situation, the general approach on the part of the therapist is necessary, and interpretation of similar behavior by group members must be formulated. First, one must turn all questions back onto the members themselves, a kind of Socratic technique. One must exploit every difference between ideas in order to present new problems and to scrutinize how ties between members may represent resistance. This technique will always lead the members into exposing new information to each other, which will increase tolerance within the group. The patient’s responses during this stage may take the form of acting out. The group members begin to love each other and find solace in their communal suffering. “We are glad to be neurotics together, and we need not be ashamed of our complaints and anxieties.” This is clearly a defense against their feeling of being inadequate to face the outside world. The unanimity of this typical group resistance is a kind of perversion of the “therapeutic alliance” mentioned previously. What an escape from the threatening world around them in daily life! However, this “tacit agreement” often requires, in addition, a behavior accepted by all, which is primarily established by the dominating member. In a group composed of males, the attempt to save some masculinity in the midst of such passive behavior will become obvious in their communications about women. I was also struck by the number of sexual affairs, betrothals, and marriages that took place at this stage of therapy. Although I did not feel it was a desirable consequence for the members to take such steps, I did not attempt to dissuade them in light of my uncertainty about the results of this form of treatment. Submissive behavior in therapy is especially remarkable on the part of new members. They are immediately seduced into an exposition of their characters, their complaints, and the settling of their tension with the others. They must find their unanimity with the prevailing code. Here the therapeutic factor is determined by group dynamics and by coping with all interactions; an equilibrium is automatically sought. It is a very lively experience, characterized less by silences than by long soliloquies. For the development of the second phase, the stage of the transference neurosis, the integration on a group level should be undermined by the therapist. He should resist the group’s inclination to stereotyped communication in a brotherly democracy and encourage the individual responses of every member. Here one may naturally point out that there are other ways of conducting a therapeutic group. But the leader, by his relatively unrevealing behavior, will become the center of the transference formation, thereby furthering for every patient the regression that is indispensable for psychotherapy. I believe that in group psychotherapy two forms of regression predominate. One is that of the “grouping,” which is mainly post-oedipal and especially a dynamic of adolescence. This post-oedipal situation is an ever-present refuge for every member in group psychotherapy (as in the mother-child relation of a very repressive kind, the primary transference in individual psychoanalysis). The other form of regression, the dyad and triad, is expressed in the oedipal and pre-oedipal transferences and their derivatives in the post-oedipal period. Naturally, it is the transference toward the therapist or toward one member (a matter intentionally omitted in this paper). But I believe, with others, that on this primitive level the group itself also has the significance of a person and especially a mother. We see, therefore, that with the therapist and group, triad relationships are possible as well. However, because the situation in which we work in group therapy is in fact post-oedipal, a regression to oedipal and pre-oedipal levels is possible only from time to time. One must not forget, however, that grouping means restricting one’s individuality to some extent and becoming subordinate to a common principle, which includes the transferences to all present, and not only the transference between two persons as in individual analysis. When the latter sort of transference is reached with the therapist, the interrelationships of the members show a preponderance of competition, a kind of sibling rivalry for the attention of the therapist. It is my opinion that at this stage of the treatment the opportunity exists to do real structural psychotherapy. The therapeutic factor becomes mainly limited to the relationship with the therapist, the only person present who is able to react and communicate without acting out in terms of a countertransference. Naturally, at this stage, interaction among the members will continue to promote adaptation, but an adaptation determined by the needs of the group and its equilibrium rather than by the needs of individual members. It is in oscillation between these two types of relation and transference that group therapy now occurs. Set forth below are two case histories chosen to demonstrate the influence of the general tension and its transition into the little drama of the individually directed transference neurosis. It is here that one may see the interplay between the two forms of regression mentioned above. Case A: At the beginning of group therapy, Pat was about twenty-seven years old. He had stopped his study because of severe work disturbances of a compulsive character. Born in the tropics, he settled in Holland when he was eight years old. At that time his parents were already separated, and in about two years a divorce was arranged. Pat’s compulsion neurosis, described further on, started in adolescence, and intensified greatly after he left his maternal home to become a student living alone in a great university town. His puberty was characterized by quarreling with his mother, a very domineering and authoritarian woman with a psychopathic style of living. His efforts to become independent were met with punishments of concentration camp severity. At the same time, the mother was seductive, sought all kinds of intimacy, and disturbed Pat by her ambivalent intentions. In Army service he became paralyzed by his compulsions and further deteriorated. Upon commencing therapy, Pat was a totally isolated young man with no real contacts. He lived alone, avoiding meetings with his mother, since they invariably ended in severe conflict. He occasionally visited other members of his family but showed only superficial warmth and half-hearted interest in them. He was apparently afraid of everyone and has withdrawn into an attitude of cynical superiority. Since he did not share with others, no one understood the queer symptoms he revealed with great difficulty and with the vagueness characteristic of the compulsive neurotic. Although he attended sessions regularly, his protest became increasingly clear. He tried to cope with questions put to him by returning them, and shrugged his shoulders when this behavior was pointed out to him. Theoretically, one must place this conduct under the heading of the orientational stage. It was a defense against the new orientation that threatened to remove him from the isolation of his everyday life. This conduct continued rather unchanged for nearly a year. By this time, the constancy of the situation, the experience of contact with others who would not be disturbed by his attitudes, began to make him more courageous, induced his “therapeutic alliance,” and some sharing began to take place. He obviously began to feel at home in this little “family” and exhibited more of his emotions, his lofty ideals, and his sensibility toward music. Positive transference toward the group was developing, which meant that everyone had become involved in some sense with his compulsion neurosis. He made endless narratives, since he felt compelled to impart information in this way. None of the members dared to object to this behavior, knowing—intuitively, it seemed—how deeply affected Pat would be. An interruption would have brought total withdrawal, and everyone was afraid of the consequence this might bring to a man so isolated and disturbed. In the second year of treatment, his protesting attitude toward the therapist changed to one of trust and admiration for the “head of the family.” The transference now became more defined as a personal relationship with the therapist rather than a part of his relation to the group as a whole. Signs of the repetitions of childhood situations now became clearer, and feelings toward the father began to emerge. In the context of a long tale of misery, the group learned more about his symptoms. He told how, prior to therapy, he had fallen increasingly in the grip of unavoidable compulsions centered, for the most part, around his toilet activities. He had gone so far as to make a check list to assure that no part of the ritual would be omitted. It was forbidden to interrupt these ritual actions in any way. Any interruption or omission made it necessary for him to repeat the entire ritual from the beginning, and doubt compelled him to endless repetitions. Consequently, he needed hours to take a bath and put on clean clothes. His reading and learning habits were also affected. He had to feel certain of knowing every word on a page before progressing to the following one. Naturally, he had not been able to produce much work in his years at the university. Fortunately, his employers were acquainted with his illness and supported his efforts to obtain therapy. Studying, however, had become entirely impossible, and he had suspended all effort in that direction.